Dive right in – this property is only a 2-minute walk from Acadia Beach! 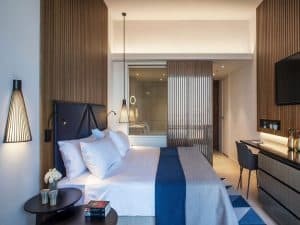 The Dan Accadia is a hotel directly located on Herzliya’s sandy beach. This luxurious hotel offers contemporary guest rooms, excellent leisure facilities and a good choice of restaurants. Complimentary WiFi is provided in all the rooms and public areas.There are 208 guest rooms at the hotel offering spacious and comfortable accommodation. The rooms in the main hotel building overlook the pool and the sea; the pretty garden chalet rooms have private terraces, some with hot tubs and guests can enjoy free access to the exclusive Club Lounge. 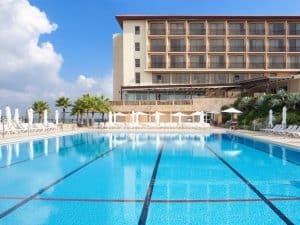 Leisure facilities at the Dan Herzliya include a large outdoor swimming pool, 6 tennis courts and a fully-equipped gym. Diving and horse-riding are also available close to the hotel. For children, there is a separate swimming pool, a playground and an activity programme during the main school holidays. The hotel has a good selection of restaurants offering international food. Guests can also dine al fresco on the hotel’s terrace overlooking the beach. 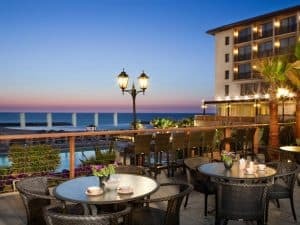 The Dan Accadia Herzliya is located directly on the beach and is just a short walk from the Herzliya Marina and its adjacent mall, where there are many cafés, shops and restaurants.